The Secret Sun: Why is the Press Ignoring Hollywood's Alien Blitz? Why is the Press Ignoring Hollywood's Alien Blitz? One thing about the entertainment press- they love to spot trends. They love to take a few scattered films or books or records and lump them together as some new sort of cultural phenomenon. You hear the word "boom" thrown around a lot. 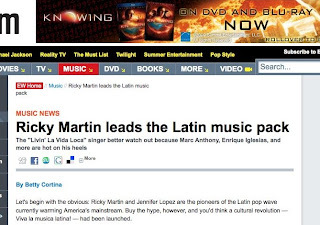 So we've seen breathless articles in the past about the Latin pop boom (mostly because Ricky Martin had a couple Top 40 hits), the fantasy movie boom, the superhero movie boom, the independent movie boom, the vampire movie boom, the religious movie boom...you name it. More often than not, most of these booms turn out to be busts, or cover story mountains made out of marginally successful molehills. So why aren't we seeing any stories in the press about the alien movie boom? 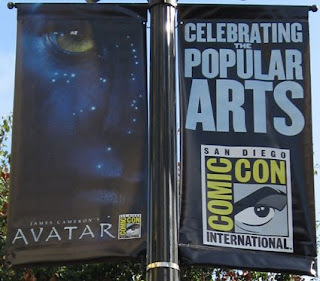 After all, this year we've seen or will see Star Trek, Race to Witch Mountain, Monsters vs Aliens, Transformers 2: Revenge of the Fallen, Alien Trespass, Knowing, Avatar, Battle for Terra, Planet 51, District Nine and Aliens in the Attic, as well as Battlestar Galactica, Stargate Atlantis, Fringe and a remake of V on television. I'm sure you guys will fill me in on any others I've overlooked. At what point does this qualify as a boom? I don't know about you but I haven't seen anything in the press pointing out Hollywood's unprecedented and inexplicable obsession with aliens this year, most especially films dealing with alien contact. Or to be more specific, films dealing with human/alien coexistence. I can understand why most media outlets are ignoring the hundreds of UFO sightings so far this year (and not just the lame, lights-in-the-night sightings) but why are the trend-spotters not paying attention to this absolute flood of alien/UFO-themed films? And what's the impetus behind these films being released this year in the first place? It's really verging on overkill. It's certainly not like the mid 70s or the early 90s when the UFO meme was strongly resonating in the collective unconscious. Most people seem pretty blase about the topic, even if they are gobbling it up in droves at the movies. PPS- Aliens in the Attic star Ashley Tisdale hails from Deal, NJ, right in the shadow of the old Fort Monmouth of Project Diana fame.